Do you remember Walt Maerki? 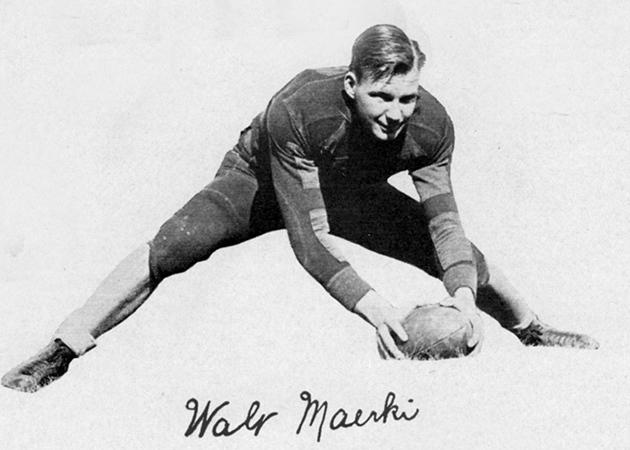 Walt Maerki graduated in 1938 and was inducted into the Hall of Fame in 2012. 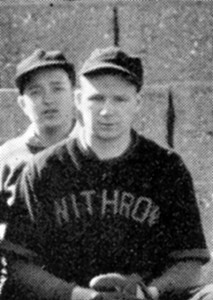 Walt Maerki (pronounced “Mur-key”) was a three sports great at Withrow from 1934-1936. He won 10 letters: four in football, and three each in basketball and baseball. In an era when there weren’t any all-city awards, Walt was named to the All-State football team for Ohio in 1937. He was also chosen to play for the All-Ohio Scripps-Howard football team coached by Angus King and Paul Brown, but had to forego playing to retain his eligibility for playing baseball and basketball. He was also an outstanding basketball player for Withrow. After graduating from Withrow, Walt played football and baseball for Ohio Wesleyan University. He then went into the Navy as a Naval Aviator flying 158 missions in World War II and was awarded the Silver Star, Distinguished Flying Cross and Air Medal.